In October, we shared an update on a laundry equipment removal project we’d been working on with RW Martin & Sons, Inc. out of Kent, Ohio. That project, which was in Brockton, Massachusetts, led to another large hospital project, which was in Los Angeles, California. Our company may be called Tri-State, meaning we are in Virginia, North Carolina, and South Carolina, but believe me, we are all over the place these days. This was a big job, done in several phases. During the first phase of laundry equipment removal, Tri-State staff tore everything out of the facility – Milnor tunnel washers, dryers with shuttle systems, and so on. 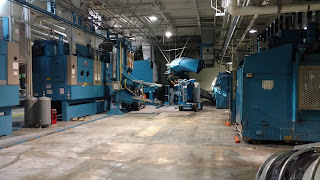 This was a large facility with a lot of big commercial laundry equipment. 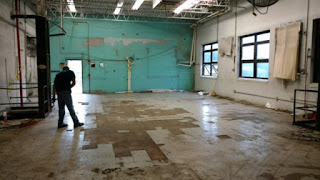 In about 6 weeks, we got it down to bare bones. After the tradesmen got the new electrical, plumbing, and such completed, Tri-State went back to receive the equipment on the docks, stage the equipment, and then complete the installation. 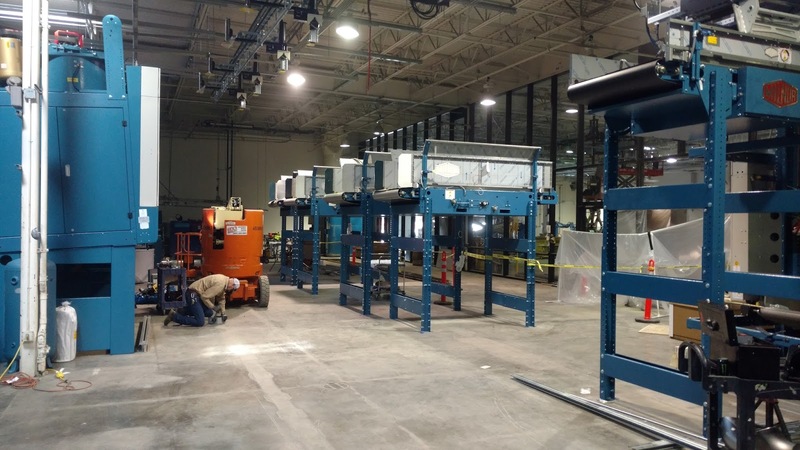 In about 3 weeks, we installed a large Milnor tunnel washer, dryers, a conveyor system – everything you would need to make a facility like this run smoothly and efficiently. I must stop here because I’m making it sound way easier than it was. 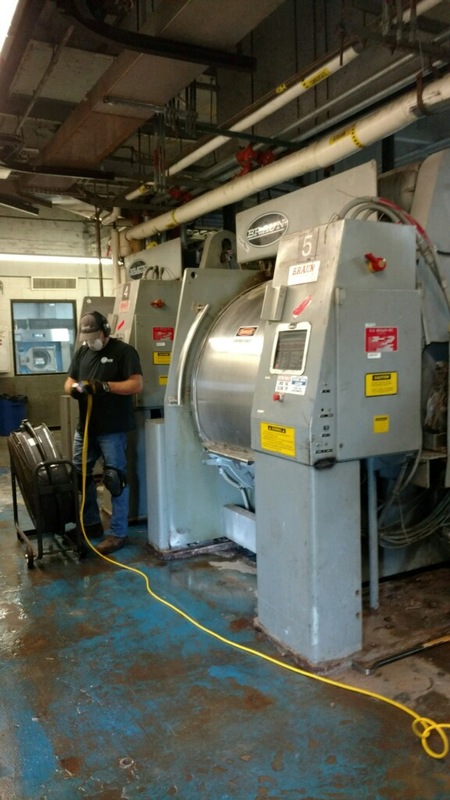 This facility was going from a steam powered production plant to a plant running without steam, now using two Parker Boiler T6800s to heat their wash, no steam up needed. This required assistance from our friends, Gulf Steam Company out of Florida, to get the plant running. In all, we spent about 9 weeks making these changes, and I have to say that I couldn’t be more pleased with the results. Check out the photos to see for yourself. I couldn’t be prouder to be a part of an organization that gets to upgrade the equipment for some of the finest healthcare facilities in our country. I recently designed a large, state-of-the-art dry cleaning and laundry facility for a long-time customer whose plant had been destroyed by fire. 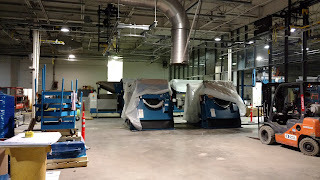 The new plant would consist of five 90-pound Realstar heated hydrocarbon dry cleaning machines, six Sankosha dry cleaning finishing bays and four Unipress Double Buck shirt finishing bays with six Unipress hot head finishing units for jeans, touch up, and linen. 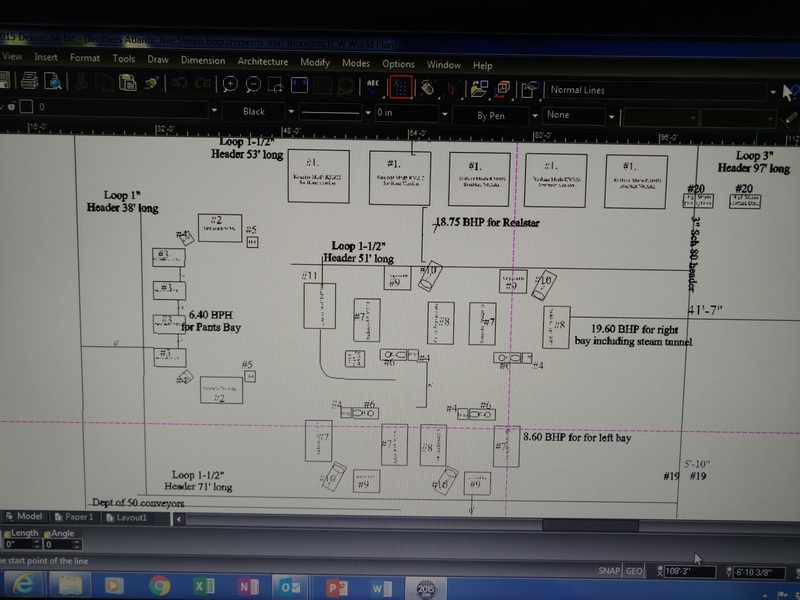 To ensure the plant ran properly, I had to calculate the steam requirements accurately, so I began by referring to all the manufacturers specs for each piece of equipment. 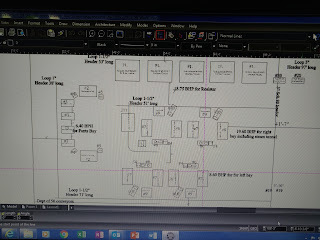 Then, I could take the boiler horsepower required and determine the pounds of steam per hour required and size the steam supply and return headers. 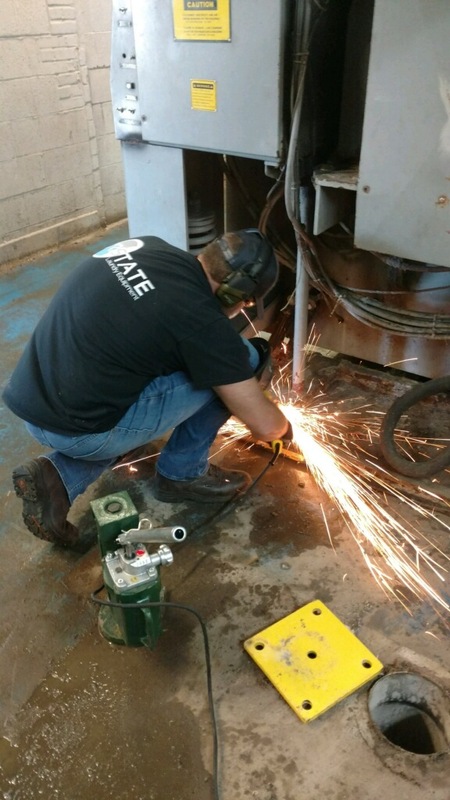 This plant's boiler requirement of 75 horsepower led me to suggest to the owners that they install two boilers, a Parker Boiler 105-70 H.P and a Parker Boiler 104-50 H.P. I know you’re adding this up, and it's greater than the 75-horse requirement I stated earlier. That's because the 70 H.P will provide the needed steam to operate the plant on most any given day. Adding the 50 H.P and setting the on-off limits will have it fire only when the 70 falls a little behind. We can almost get enough BTU’s out of a stack economizer on the 70 H.P. to heat all their shirt laundry water with a storage tank and circulating pump. Hot water generated from a stack economizer is truly free energy because you have paid for it, and it’s on its way out of the stack. Why not harness all that energy? The 70 will be the master and carry most of the load. We want it on and firing on high as much as possible to carry the load and make hot water. Additionally, flue gas heat exchangers don’t make a lot of ROI unless your boiler is 50 H. P. or higher. You simply can’t get enough BTU’s to do the job. One issue with this type of water heating system is that it’s making hot water the entire time the boiler is firing, and if you don’t have the demand, your storage tank weeps or pops off due to overheating. Then you have wasted water down the drain, giving up your free BTU’s. 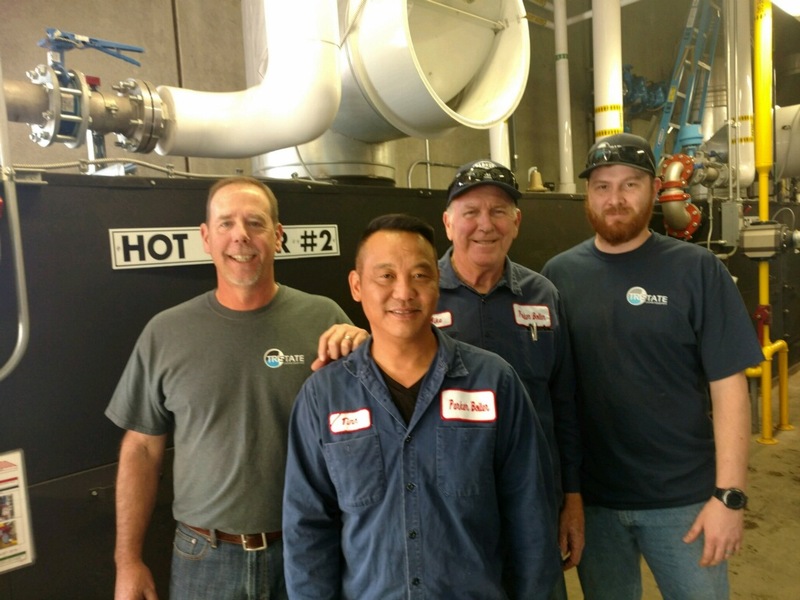 The 50 H.P comes in when, in the afternoon, they no longer have the demand to make hot water while perhaps finishing up some shirts or running dry cleaning for the next day. They can turn off the 70 and finish up with the 50. 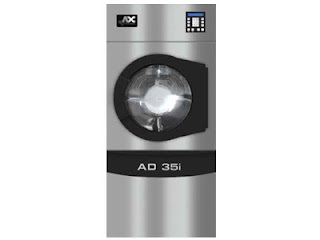 They will also just use the 50 on Saturdays to run dry cleaning machines only and maybe press some dry cleaning for a head start on the week. The steam header is also designed with valves for the header to separate the high-pressure and low-pressure sides allowing them to open or close for fewer loads and not building steam pressure throughout the plant and wasting energy. Of course, this would be done using the 50 H.P because boiler requirements are low and there is no need for hot water. One final detail that I consider to be very important but almost always overlooked or misunderstood is when designing steam headers, you should slope the supply and return so the system drains the condensate, and it is pushed by pressure on the return side. A slope helps it drain completely after shutdown, avoiding corrosion and hammering on startup. 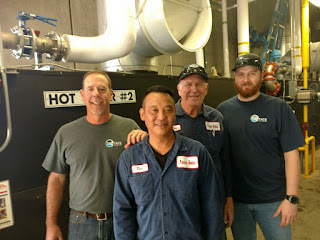 Parker Boiler engineers recommend 1” every 20’. If you need to look at your plant’s steam system requirements and are unsure where to start, give Tri-State a call at 1.866.885.5218. We are happy to help. 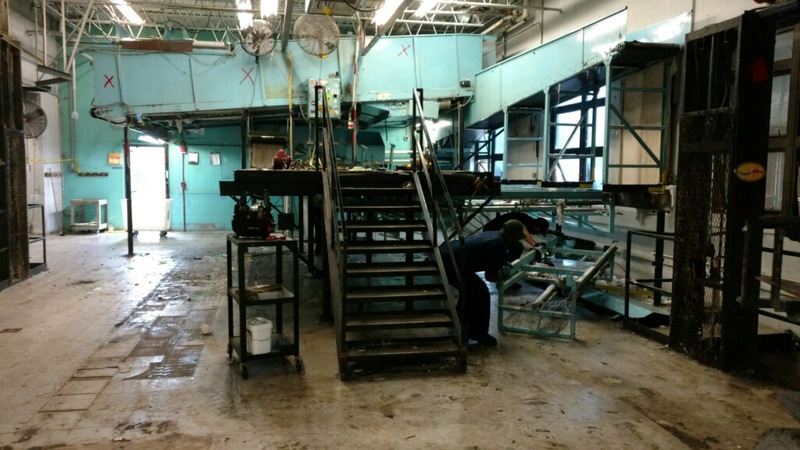 Tri-State is working with RW Martin & Sons, Inc. out of Kent, Ohio on a project at a hospital in Brockton, Massachusetts. You might be wondering how a partnership between a company in North Carolina and a company in Ohio came to be. Well, Kevin Lawson and Shawn Martin met while serving together on the board for the Textile Care Allied Trades Association (TCATA), the two developed a friendship based on a mutual love of all things laundry and dry cleaning equipment related, and the rest is history. 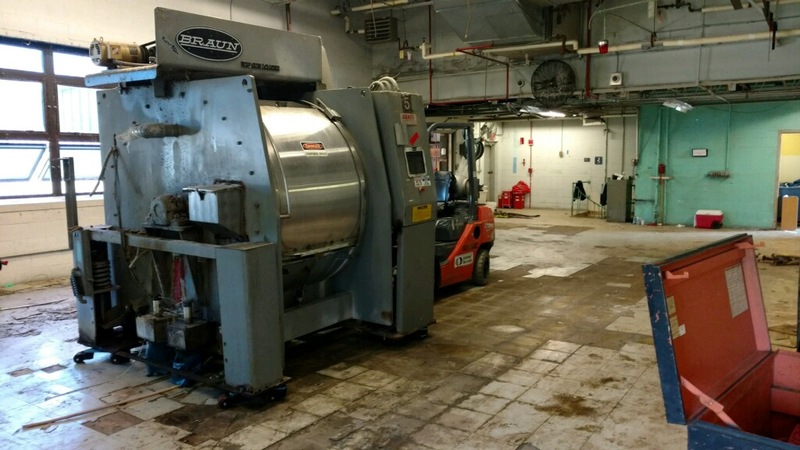 Tri-State spent approximately 4 weeks removing 3 – 800 pound, 2 – 400 pound, and 5 - 150 pound washing machines along with feeders, ironers, folders, an immense soil sorting system, laundry trolley system, all tanks, pump stations, and air compressors. 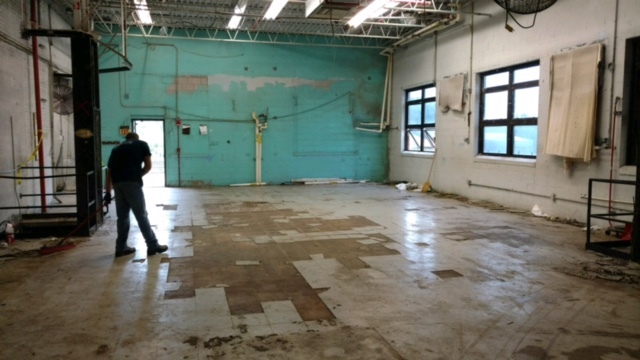 Our knowledgeable combined staff ensured that as much as could be salvaged or re-used would be. 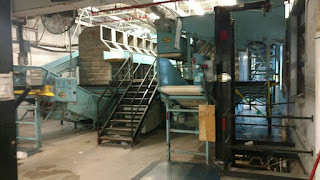 Much of the equipment will be scrapped and recycled, while the remaining will go into storage until the renovations are complete. 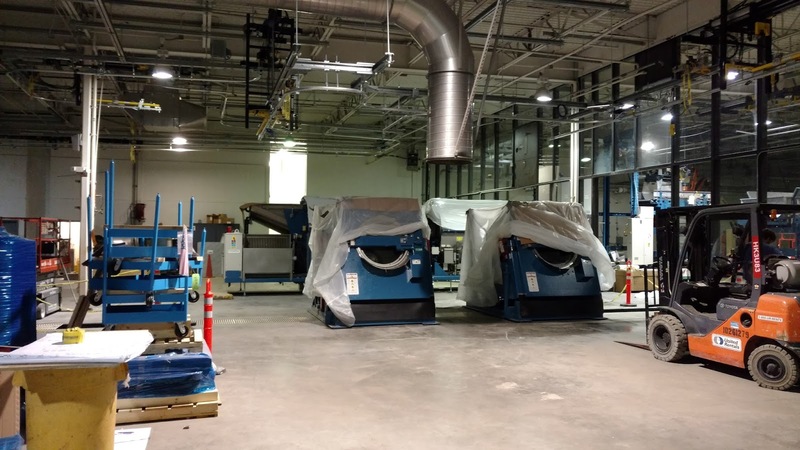 The renovation will take approximately 1 – 1 ½ years to complete and after that the stored equipment along with new, up-to-date equipment with the latest technology will be installed. We are so excited to be a part of this project and look forward to sharing more photos as it continues. 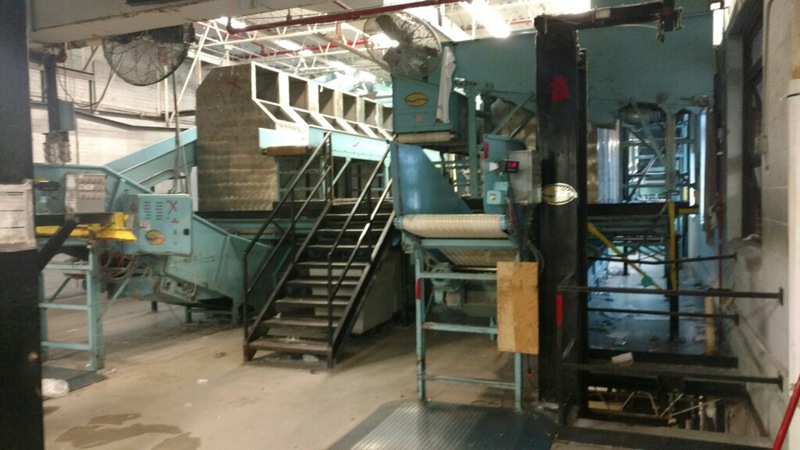 Not only does Tri-State Laundry Equipment repair, sell, and service new and used dry cleaning and laundry equipment, as you can see, we can also clear out old and dated equipment, leaving the space a fresh, clean, blank slate ready for the latest and greatest. 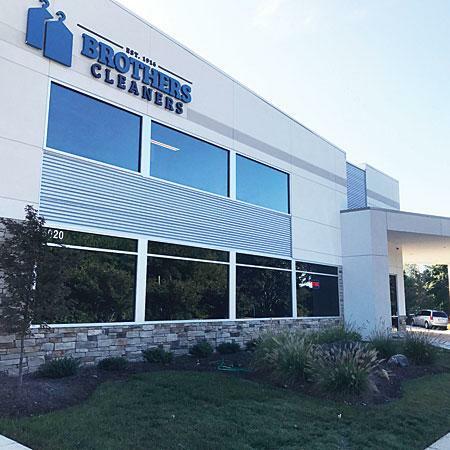 If you need help updating your facility, give us a call at 866-885-5218.